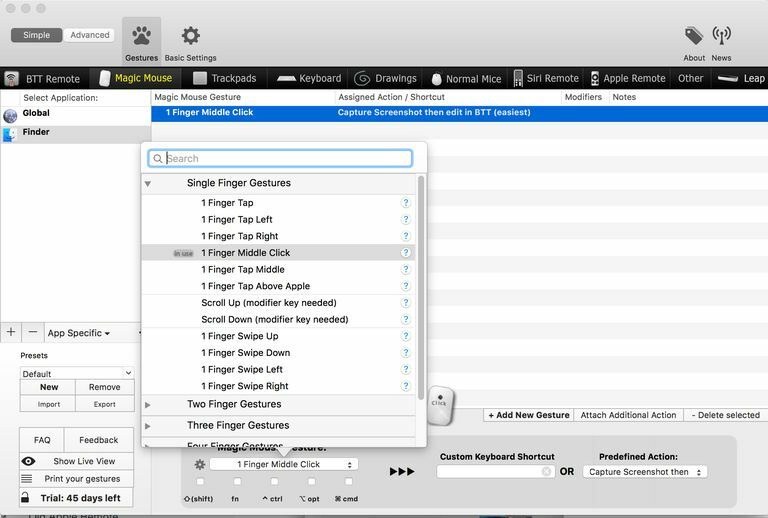 BetterTouchTool is perhaps best known as an easy way to create custom gestures for use with a Magic Mouse, a Magic Trackpad, or a MacBook's built-in multi-touch trackpad. The need for this app becomes apparent after the first or second time you try customizing your mouse or trackpad, Apple just doesn't provide many gesture options, and the ones it does provide cover only the very basics of what can be done with a multi-touch surface as a pointer interface. Works with Magic Mouse, Magic Trackpad, and MacBook Trackpad. Works with normal (non-multi-touch) mice, Siri Remote, Apple Remote, and keyboards. Can turn your iOS device into a remote pointing device for your Mac. Includes BetterSnapTool functionality to control how windows snap to display edges. The developer is dropping support for OS X Mavericks and earlier. Must read the instructions for best results. OK, let's start with one of the cons; you really need to read the manual to get the most out of BetterTouchTool. It's not that BetterTouchTool is difficult to use; it just has so many features that you may never discover all of them by simply clicking or tapping around. So, having to read the manual isn't really a con, just a requirement many Mac users don’t bother with. However, there's a real con within the manual; it isn't complete, with some sections still blank. At best, the manual is a work in progress, and that's a shame because BetterTouchTool is an amazing app, but it needs a complete manual. BTT (BetterTouchTool) is supplied as a download from the developer's website. Once downloaded, BTT just needs to be moved to your /Applications folder. After that, simply launch BTT as you would any app. One of the first options you may wish to consider is setting BTT to launch automatically whenever you log into your Mac. This option is available in the Basic Settings section. I only mention it now because the default is not to have BTT automatically start up, which surprised me when I went to use my spiffy new gestures the next time I started my Mac. BTT doesn't have an active interface when in actual use; its job is to run in the background and intercept mouse, keyboard, and trackpad activity so your custom gestures and controls can be applied to your inputs. However, BTT does have an interface for setup and configuration. The BTT preference window is split into multiple sections, with a toolbar across the top, a tab bar for selecting the type of device for which you're creating a command or gesture, a sidebar that lists apps the gesture can be used in, and a central area for defining gestures. BTT helps you through the process of creating a gesture by including numbered steps that are highlighted as you move through the gesture creation process. You start by using the device tab to select which pointing device the gesture is used with; in this example, I'll use a Magic Mouse. Once the device is selected, you choose the app you wish to use the gesture in. You can select Global, which will allow the new gesture to be used everywhere, or you can pick a specific app. Once you pick an app, you can then add a new gesture. BTT comes with a large library of predefined gestures. These gestures have no action attached to them; they are just the gestures themselves, such as tapping the middle of your Magic Mouse, a force-click at the bottom left corner of your trackpad, or a multi-finger swipe. This means you can pick a gesture and then assign a function, either by using a keyboard shortcut for the function you wish to use or by using BTT's list of predefined functions, essentially more complex functions that BTT has put together for you. You're not restricted to BTT's premade gestures and functions; you can create your own gestures and your own functions. Creating a new gesture is as easy as selecting the drawing tool and drawing your gesture in the white drawing area. You can create very complex gestures, including swirls, circles, even letters of the alphabet. Once you create and save a gesture, you can then assign it to an action, using the normal BTT method of creating a gesture noted above. BTT incorporates window snapping; this is similar to the window-snapping feature available in various versions of the Windows OS. With snapping enabled, a window dragged to the edges or corners of your display will snap to new configurations, such as maximized when moved to the top edge, resized to left half when dragged to the left edge, or reduced to quarter size when moved to the corners. Using the BTT preferences, you can define window sizes when snapping, borders, background colors, and much more. Once you have used the BTT preferences to create the gestures and assign functions to each one, BTT becomes a background process, one you can see running if you open Activity Monitor, but, otherwise, is hidden from sight. BetterTouchTool does exactly what you would expect the app to do: give you better control over the use of gestures on your multi-touch pointing devices. But BTT goes beyond what's expected and gives you the ability to customize keyboard shortcuts, use multi-button mice more effectively, even use your iOS device as a remote multi-touch trackpad for your Mac, very handy if you're using your Mac for home theater, or as part of a presentation system. BetterTouchTool uses a pay-what-you-want license structure. You can choose from a low price of $3.99 to as high as $50.00; the developer recommends a price of $6.50 to $10.00. A demo is available.